In recent years, enterprise leaders have sought to disrupt their markets and competitors through digital transformation (DX) enabled by cloud, mobile, social, and big data/analytics and accelerated by new digital technologies (Internet of Things, robotics, 3D printing, next-generation security, cognitive interfaces, and virtual reality, among others). DX is effectively driving changes to business models, customer relationships, and partner expectations, and it has fundamentally and permanently altered the culture, processes, and tools critical for effective IT governance. A growing percentage of enterprises are thriving in this new world of digital technologies. Unfortunately, a sizable percentage are deadlocked into accommodating digital transformation with traditional IT capabilities. Several years ago, IDC started to focus research on how enterprises were initiating and enhancing their DX journeys. At that time, there was an abundance of experimentation with digital opportunities, with plenty of unique applications leveraging emerging technologies. The norm were more technology proof-of-concept experiments than scalable technology deployments. Now, IDC is quantifiably documenting how businesses are reinventing themselves and significantly evolving their DX efforts. IDC is now witnessing major digital technology deployments, especially from industry leaders expanding at-scale IT operations. 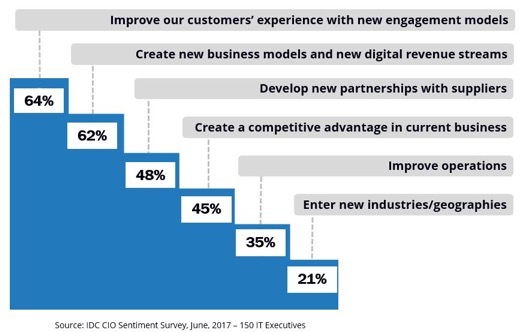 As evidenced in Figure 1, effective IT executives are focusing technology deliverables on true business outcomes such as improving the end customer’s experience, generating new digital revenue streams, developing new partnerships and creating competitive advantage. Much lower on the list of priorities is the traditional improvement of IT operations. While progress is being made, IDC has determined that about 60% of IT organizations are getting stuck in stage 2 or 3 of their five-stage digital strategy. Generally, about one-third of companies are well along, but two-thirds are struggling with their digital strategies. Why is this happening with nearly two-thirds of IT organizations? IDC has quantified multiple causes behind this deadlock, but identifies the top five obstacles inhibiting the contribution of most IT organizations to the business transformation originating from digital technologies. IDC now has a better understanding of where enterprises need to focus to blast through this digital deadbolt. By studying the one-third of organizations that are succeeding on their digital journey, IDC obtained insights into the pathways these leaders are using on their digital journey. In other words, what techniques got them thru their deadlocks in each of these five areas? Figure 2 outlines the best pathways these “digital native enterprises” are using to accelerate DX. Essentially, “digital native enterprises” focus on the immediate and long-term performance of DX by linking critical success factors to KPIs that focus on business outcomes. Successful DX requires an organizational structure that actually embeds digital “in” the business. Effective DX roadmaps are strategic instead of tactical and reactive, and prioritize DX opportunities through use case scenarios. Productive DX demands that the enterprise’s business and technology expertise are reshaped by initiating new DX capabilities. And finally, “digital native enterprises” are rearchitecting DX platforms for the scale essential to expanding business imperatives. Bill Keyworth, IDC Vice President Research will be speaking at the 2018 CIO Peer Forum in Vancouver.